As has been the case for the last two years, the P Zero Yellow soft and P Zero Red supersoft have been nominated for the Monaco Grand Prix: the two softest tyres in Pirelli's range. Monaco is the slowest and most twisty circuit on the calendar, where it is hard to overtake, so this makes rapid warm-up and high levels of mechanical grip from the tyres essential. Nonetheless, wear and degradation is also the lowest of the year: meaning that a maximum of two pit stops per car should be the norm. Unlike every other grand prix, free practice takes place on Thursday rather than Friday, which has a consequent effect on track evolution – as the track is still open to normal traffic at certain points during the grand prix weekend. In the past it has also rained at Monaco, meaning that the Cinturato Green intermediate and Cinturato Blue wet tyres could also come into play. Paul Hembery: "In Monaco we'd expect an average of two pit stops per car, because in complete contrast to the last race at Barcelona, Monaco has very low tyre wear and degradation. This doesn't make the race any less strategic however, as in the past we have seen drivers trying completely different strategies yet ending up very close to each other at the finish. The last race in Spain was won from lower down on the grid than it has ever been won before, so it will be interesting to see if this pattern can repeat itself in Monaco: a track that is renowned for being difficult to overtake on. Because of this, strategy will become even more important than usual, with teams trying to use tactics to improve on their starting positions." Jean Alesi: "Monaco is a circuit that I've always absolutely loved: I think I've been on the podium three times, set two fastest race laps, and in my first race there I finished second, behind Ayrton Senna. My first taste of the Monaco circuit was actually with Pirelli, when I was driving for Tyrrell in 1990 and we had qualifying tyres. Driving on them was so much fun and the whole place is simply magical. When you were out on a qualifying lap the crowd used to just erupt…Qualifying as high up the grid as you can is important, but maybe not quite as important as it used to be. We've seen many times this year that the race is much more important, and with a good strategy you can overcome a grid position that is not so good. So even if qualifying isn't perfect there is still the opportunity to do something special and that is a big advantage that Pirelli has brought to Formula One. Tyre wear and degradation is low in Monaco but it is still something you have to think about because the circuit gains massively in grip over the course of the weekend: perhaps more than anywhere else all year. 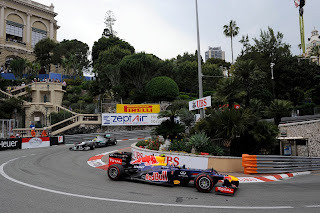 You always use the soft tyres at Monaco so you can push hard, which is a great feeling." So far, there have been no safety car periods during the 2013 season. The tight confines of Monaco, with its never-ending Armco and very little run-off means that this is statistically likely to change. Along with Singapore, Korea and Canada, Monaco has one of the highest probabilities of safety car deployment all year, at around 80%. This will clearly have a profound effect on the race strategy. The top 10 finishers last year all employed a one-stop strategy, stopping at about the lap 30 mark. All but two of them started the race on the supersoft tyre and then moved onto the soft. The Monte Carlo Grand Prix track has a record number of 'leasts' – as well as being the slowest track of the year, the surface is also the least abrasive of the whole season. Monaco is particularly heavy on brakes. This transmits heat to the tyres, which adds to the stress placed on the tyre structure. Entering Sainte Devote, for example, the cars scrub off 160kph in just 100 metres. The tyres also have extremely big demands placed on them in the swimming pool complex, where they hit the kerbs at more than 200kph and experience lateral forces of 3.65g. The driver makes over 130 significant steering inputs during every lap at the Monaco Grand Prix, changing gear on average every 50 metres. All of these actions work the tyres extremely hard. The Loews hairpin is the slowest corner of the season, taken at just 47kph. Due to the low speed there is no aerodynamic downforce at work, so the full steering lock means that the front-right tyre is doing all the work when it comes to changing direction.